Weâre always on the go, moving from one activity to the next. Relish those few moments of comfort and closeness when time slows down. 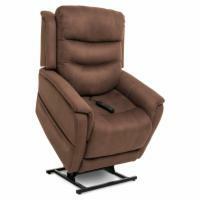 The Sierra Collection by VivaLift!Â® delivers lasting comfort. Infinite, lay-flat positioning maximizes your comfort while connecting with your loved ones. Independent functions on the Sierra recliner allow you to put your feet up with the footrest extension, while keeping the power headrest in the precise position to support your neck.